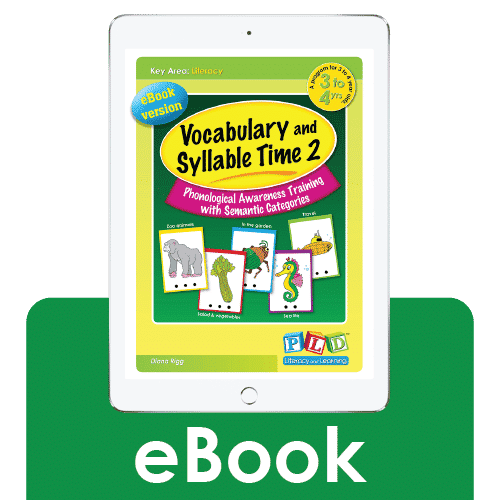 Teaching children to blend and segment syllables is an important step in building phonological and phonemic awareness (which in turn lead to strong literacy and reading skills). 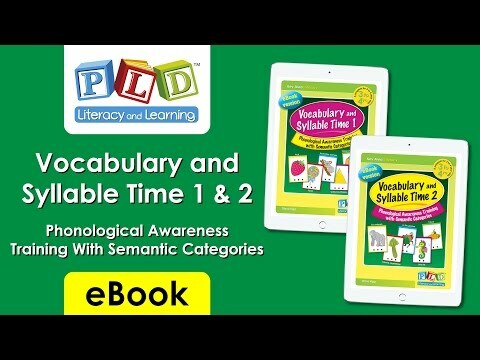 A program for 3-4 year olds, or for older students who require vocabulary development. Provides scripted instructions and clear guidelines. Targets the semantic/vocabulary groups: Zoo animals, in the garden, travel, salad and vegetables and sea life. Includes a ‘progress check’ assessment, so that when the screen is used in conjunction with the program, the program aims to maximise early intervention efforts. Perfect for use in a classroom while utilising screen mirroring for displaying the eBooks on large screens such as a Smartboard, TV or projector. This can be achieved using various methods. Refer to the FAQ page for detailed instructions. Save up to 25% off the printed book price with PLD’s eBook range.